The Clinton Foundation announced it’s laying off 22 staffers on the Clinton Global Initiative, keeping with a plan to deal with the negative spotlight put on the organization during former Secretary of State Hillary Clinton’s presidential campaign. The layoffs will take effect April 15, the Clinton Foundation said in a filing with the New York Department of Labor Thursday, citing the discontinuation of the Clinton Global Initiative. The move is part of a plan put in motion ahead of the presidential election in order to offset a storm of criticism regarding pay-to-play allegations during Clinton’s tenure as secretary of state. The layoffs were reportedly announced internally in September, ahead of Clinton’s stunning loss to President-elect Donald Trump. Many other employees had already begun looking for or accepting other jobs at that time, as it had become clear the future of the initiative was in doubt. It’s unclear how many of the once 200 strong staff might remain at the Clinton Foundation in some other capacity. The Clinton Foundation could not immediately be reached for comment. While the FBI concluded its investigation into Clinton’s use of a private email server while secretary of state, a second investigation into the Clinton Foundation regarding allegations of corruption during that same tenure is ongoing. 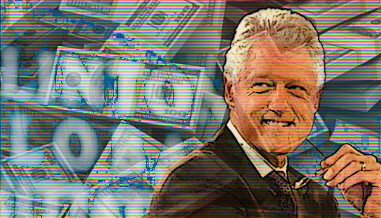 The decision to sunset the Clinton Global Initiative reportedly set off a dispute within Clinton Foundation circles regarding the best way to handle the fallout from the allegations. Some complained the layoff process was “insensitively” handled, Politico reported, while others took issue with the optics of allowing anyone with the Clinton Global Initiative to stay on. I poked into this a bit, looking at the guest list from the latest CGI shindig. I understand why the celebrities, the charity heads, and the international politicians were there. What I don't understand is why the Bleacher Report guy was there. Was he going to help solve world hunger via slideshow listicles? Methinks they're in the hide the stolen silverware phase. The CGI knows there are investigations both ongoing and more to come. And there's no way people aren't going to jail if they can't start burying the bodies.